Are you looking for a way to study some aspect of the Bahá’í Faith while balancing work and family? If so, studying individually in one of our on-line courses will suit your needs. Individual study means that you are committing to study alone in your own home on your own computer. But you will not really be “alone.” The Wilmette Institute brings together an on-line learning community that includes one or more faculty members to guide you through the course; a mentor to answer your questions; and students from all over the world, who share perspectives and insights through the forum provided in the course. Do you study best in a group situation? Organizing a group in your community to take one of our on-line courses is perfect for you. Group study means that you will be able to study alone in your own home on your own computer. But if you register as part of a study group (with one or more of your friends—up to ten of you), you can supplement your personal study with discussions every week or two with those in your group. Your group will have access to one or more faculty members to guide you through the course; mentors to answer you and your group’s questions; and, through the forum provided for the course, the insights and perspectives from fellow students from all over the world. Group Leader: Your group will benefit from having a group leader. These detailed Study Group Guidelines will help the group leader form the group and organize successful group meetings. Look out for your Registration Confirmation email. Consult with prospective group members on the payment options (see below). Fee structure: There is an initial fee to create the group and register the primary registrant (generally, equal to the cost of an individual registration) and a group member fee for each additional group member (generally, equal to about 60% of the individual registration). There is no senior, student, or pioneer discount for groups. That means if say two seniors (65 years or older) register as a group, there will be no benefit in terms of fees, but if three or more seniors get together there will be an overall saving. Study group members may wish to pool together to reimburse the primary registrant the extra cost of the initial fee. 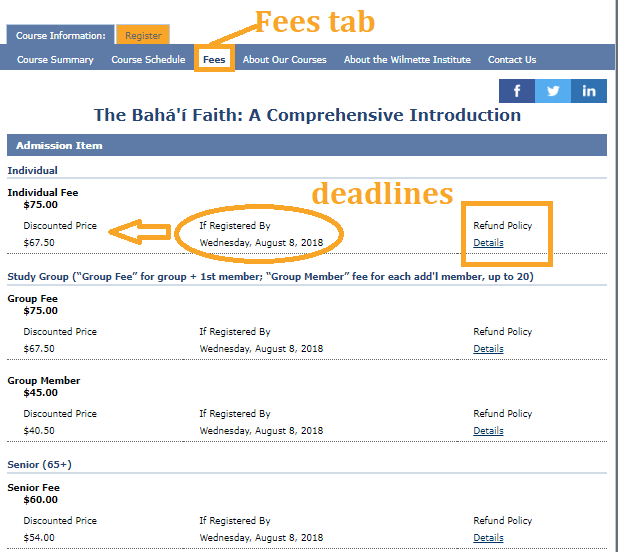 The Fees tab shows the deadline for the early registration discount. Click Details on the right to see refund policies. Managing Group Payments: There are three approaches to managing group payments, or you may choose a combination to suit the pockets of individual study group members: Single payer, Multiple payer, and Assisted payments. Single Payer: The primary registrant (the person who registers first) pays the fees for all the group members with one credit card. The study group members then reimburse the primary registrant, distributing the fees as agreed on consultation. This is an ideal method for small groups who do not require tuition support from the Wilmette Institute. The group members can be added by the primary registrant one at a time, or in batches, using the steps outlined in the Multiple payer approach below. Mailing addresses will be required at registration, in addition to the names and email addresses of the group members. A minimum payment of $10.00 per registrant is required at registration, and the balance may be paid later, before the course begins. Study groups are also eligible for the 10 percent early registration discount! If you register and make a partial payment 4 weeks before the start of the course, your discount will be preserved as long as you pay the balance by the time the course starts. Multiple payer: the primary registrant registers, and pays the initial fee only. The primary registrant then forwards the Group Registration Confirmation email to the study group members. Each study group member can then register and pay for themselves using the steps below. This approach is ideal for larger groups, or if some group members require tuition support. Go to the course registration page. Click on “Already Registered?” at the top right. Enter the primary registrant’s name, email address, and the group confirmation number. Click on the “My Group” tab, and on the My Group page (see screenshot below) click on the “Add Person” button. Follow the instructions to add and pay for yourself. Assisted Payments: If one or more study group members need tuition support, the Multiple payer approach is recommended. Those members who do not require support may register and pay as described above. Those who do should first read our Tuition Support Policy, then write to us at learn@wilmetteinstitute.org, saying how much you can pay, which course you want to take, and the name of the primary registrant. Please also provide your mailing address. The Wilmette Institute will register you, apply your discount, and send you an email with instructions on how to pay the balance due.